Baltimore Comic Con News: British Invasion 2! VIP Packages and Tickets for the Baltimore Comic-Con Now On Sale! Baltimore Comic-Con Announces Stan "The Man" Lee as Guest of Honor! PLB Comics will debut their newest release, The Fall: Vengeance and Justice at this year's Baltimore Comic Con, table A76. A collection of short stories featuring PLB's break out character The Fall, Vengeance and Justice will feature writing and art work by such notable indie comic creators as Russell Walton, Jim McMunn,Nathan Thomas Milliner, Mathew and Josh Shockley and Brad Hudson. A special limited run blood soaked cover variant of the issue book will be available only to attendees of this year's Baltimore Comic Con. 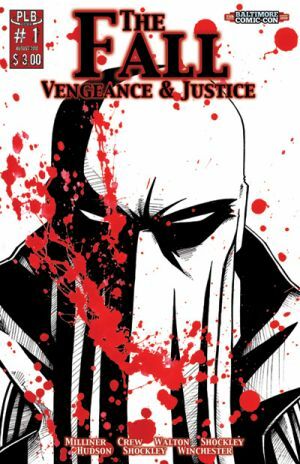 The Fall Vengeance and Justice #1 is the newest title offered by PLB Comics. After the success of Mat Shockley’s Fall storyline from PLB COMICS PRESENTS #1, 2, and 3 PLB Comics felt that the demand for The Fall to have his very own book was too great to ignore. With an impressive lineup of some of the finest Independent artists around, The Fall: Vengeance and Justice # 1 serves as a perfect jumping on point for new readers, and offers more gritty, hard-hitting Fall action for fans of the Fall story line from the “Presents” title. PLB Comics is an independent group of artists and writers located on the Eastern Shore of Maryland.PLB offers original concepts and fresh perspectives on the world of Sequential Art, while maintaining an appreciation for mainstream classics. Founded in 1987, PLB Comics has been producing professional comic books and commissioned works utilizing the talented writers and artists found on Maryland's Eastern Shore. The PLB Comics team combines elements of Sci-Fi, Fantasy, Adventure, Horror, Romance and Drama to create comic books that appeal to the broader audience while always keeping a flair for originality and innovation. Many years ago, brothers Josh and Mathew Shockley started creating their own comics. The two decided to focus their passion for comics toward the goal of producing comic books that met their discerning standards. PLB Comics was born, but it was about to grow from just the two brothers to a well-rounded and complementary creative team. After High School the two attended the University of Maryland Eastern Shore (UMES), and while there they met Karlton Hargrove, another fervent comic fan and top notch creator. The team now complete, PLB comics was ready to take off, and several issues later it shows no sign of slowing down. With over a 1,000 issues sold, and a fervent cult following, PLB Comics is quickly becoming a creative team to watch on the indie comics scene.